Pulaski Congressman Ross Bass had defeated Governor Frank Clement for the Democratic nomination to succeed the late Senator Estes Kefauver. Bass faced Republican Howard Baker in the general election. It was the first time Frank Clement had lost an election and his defeat had been sweeping. Congressman Bass confidently approached the general election, running on the same ticket as Senator Albert Gore and President Lyndon Johnson. There had been signs Tennessee was no longer the Democratic bastion it had once been. The Volunteer State had gone Republican in the last three presidential elections; in 1952 and 1956 it had voted for GOP Dwight Eisenhower. In 1960 Tennesseans preferred Richard Nixon to John F. Kennedy. Both of Tennessee’s seats in the U. S. Senate had not been up for election together at the same time since 1934. Gore was running for a regular six-year term while Ross Bass was the nominee to finish the last two years of the late Estes Kefauver’s term of office. Bass won the general election, albeit by a reduced margin. Howard Baker swept East Tennessee and won several counties in once solidly Democratic Middle Tennessee. Baker also won a handful of counties in West Tennessee. Baker carried Knox and Hamilton counties while Bass carried Davidson and Shelby counties. Still, Baker won more than 46% of the vote in the late E. H. Crump’s former domain of Shelby County; only in Davidson County did Ross Bass win by something resembling the kind of majority received by a Democrat. In Davidson County, Baker won less than 40% of the vote. The final tally was Ross Bass winning with 568,905 votes to 517,330 for Howard Baker. Dan Kuykendall, the GOP nominee against Albert Gore, won 46% of the vote in the general election. Lyndon Johnson beat Barry Goldwater with 634,947 votes to 508,965 for the Arizona senator. Howard Baker had actually run ahead of Barry Goldwater in Tennessee. Ross Bass had run less than 2,000 votes behind Albert Gore. No one watched events more closely than Governor Frank Clement. The governor had once been confined to private life once before, a dismal four-year period of forced exile from the governor’s mansion. 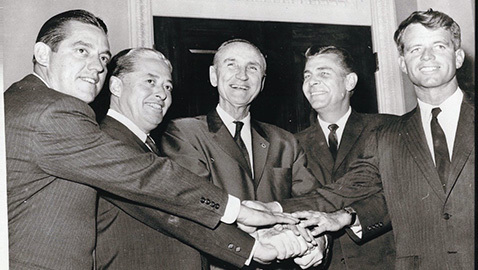 Even though he had lost the primary election for the U. S. Senate to Ross Bass in 1964, he had another opportunity to run in 1966. He could not seek reelection as governor that year, but could either run for the Senate or retire from politics, at least for a period of time. Bill Kovach, who wrote “Capitol Spotlight” for the Tennessean, thought Clement’s “strongly conservative campaign” had been “one of the major miscalculations of the year” and the governor had learned a lesson from that experience. Kovach thought the governor’s Christmas message, which had flashed across TV screens in Tennessee, had made Clement seem more human and less like “some aloof politician.” While long noted for his oratory on the stump, Frank Clement had not fared nearly so well on television. The governor had participated in a television series highlighting visits with Tennessee’s chief executive, including a two-part tour of the governor’s mansion. Kovach conceded all of Clement’s actions fit perfectly well within the expected role of a governor, but insisted they also helped to refurbish the governor’s tarnished image. Bill Kovach’s suspicions were well founded; few people in Tennessee who knew anything about politics thought Frank Clement would simply leave quietly. Most considered it a certainty that Clement wanted to vindicate himself by defeating Senator Ross Bass in the Democratic primary and go to Washington, D.C. and take his seat as a member of the United States Senate. The governor got quite a lot of publicity when he called the Tennessee General Assembly into special session on March 14 to consider property tax assessments and a $25 million surplus. Clement wanted the legislature to propose an amendment to Tennessee’s Constitution “to classify property – – – which will allow it to be taxed at different rates.” Clement was also one of forty governors who received a classified briefing from Secretary of State Dean Rusk about the war in Vietnam. Governor Clement made his announcement official on May 31, 1966. He would challenge Ross Bass inside the Democratic primary for the senatorial nomination. Clement promised he would treat the office with “the dignity and respect it deserves”, while assuring Tennesseans he would not neglect his duties as governor during the campaign. Senator Ross Bass made a political mistake while attending a Democratic fundraising dinner in Washington, D. C. The mistress of ceremonies, attempting to make a word play on Bass’s name, referred to him as “big mouth Bass,” a characterization the senator did not appreciate at all. Growling he had not wanted to attend the dinner in the first place, Bass muttered he thought he would leave, then jumped up from his table and stalked out, leaving his beautiful, albeit embarrassed wife Avanell by herself. Clement used Bass’s stomping out of the fundraiser in his own speeches. While speaking to a crowd of 400 people at Trenton in front of the Gibson County Courthouse, Clement said, “I was invited here…I wanted to come…I am going to stay until I have shaken every hand on this Courthouse lawn.” That is precisely what the governor did after the conclusion of his thirty-minute speech. Whether Frank Clement was able to reinvent himself for the 1966 senatorial campaign remained to be seen. Both the governor and Senator Ross Bass campaigned at a furious pace in the humid heat of July. The outcome of the election would determine not only their own respective political fates, but that of Tennessee’s politics for decades to come.